Let’s talk about the group portraits. You know, those shots that probably no one likes, but we all have to take anyway: his family, her family, all the family, none of the family, the preacher, the flower children, etc., etc… The goal here is to improve your speed without sacrificing quality. A little planning makes all the difference. Build your shots in such a way that most of the people you photograph don’t have to leave and come back. Here’s an example of how this might work… (For these examples I’m going to use a stage as the area where I’m shooting.) Start with the bride and groom and add the grooms parents; shot. Then add his siblings; shot. Have the parents step just off to the side; shot. Parents come back in and add siblings’ spouses; shot. Siblings kids join too; shot. Groom’s extended family joins; shot. 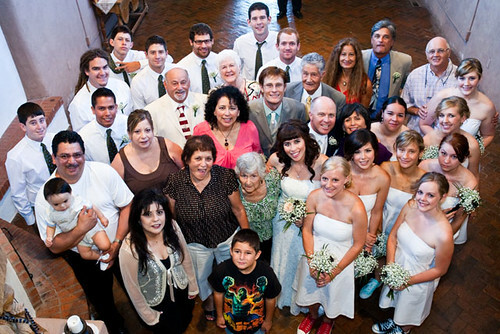 Move the groom’s family all to one side, add the brides whole extended family; shot. 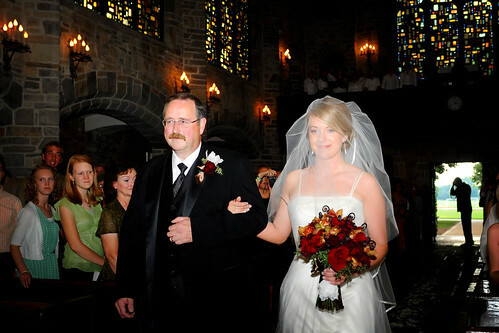 The groom’s family could now be done… dismiss them unless they are part of the bridal party. Now we play the subtraction game… balance out the bride’s extended family; shot. Cut it down to parents, siblings, spouses, and kids; shot. Cut out the kids; shot. Cut out the spouses; shot. You’re now down to just the bride’s parents and siblings; shot. Lose the sibs; shot. You are done. Every wedding that I have shot is different, and requires a different set of group shots, but this is a sample of what you want to do for efficiency and simplicity’s sake. Set yourself up for success… take a sample shot or two before they really count and set your camera on manual. You don’t want your exposure to change from image to image. Remember that spacing illustrates relationship. Keep the parents next to the bride and groom, let the aunts and uncles be further away. It’s OK to keep shuffling your group as new people join and the overall relationship dynamic changes. Practice makes perfect, they say. Group portraits are like a big puzzle and the faster you can do it, the more happy and relaxed your bride and groom will stay. A group shot from Caryn and Cody's wedding. Check out the rest of the collection at http://carynandcody.rowangillson.com.